Yu Kurosaki Fujin series kitchen knives not at stock. Yu Kurosaki Fujin series fearture Nickel Damascus-patterned blades with a core of VG-10 stainless steel for professional with a hardness of 60-61 HRC, which provides excellent rust resistance and a long-lasting edge as well as its beautifulness. The blade surface has Damascus and unique hammered FUJIN texture which causes an image of a Japanese god believed to control the wind. The handle of Fujin VG10 Damascus Series knives are made of Octagonal-shaped Rosewood with Honduras Wood Ferrule for beauty and durability. Now you can buy Yu Kurosaki Fujin VG10 Damascus Series Santoku, Petty knife, Chef knives (18 and 21 cm) and Bunka knife. Yu Kurosaki is a blacksmiths well known in Japan by producing very unique hammered blade design. He works in Takefu Knife Village where he apprenticed with Hiroshi Kato. Yu Kurosaki makes very sharp kitchen knives with unique & stylish design on his blades. 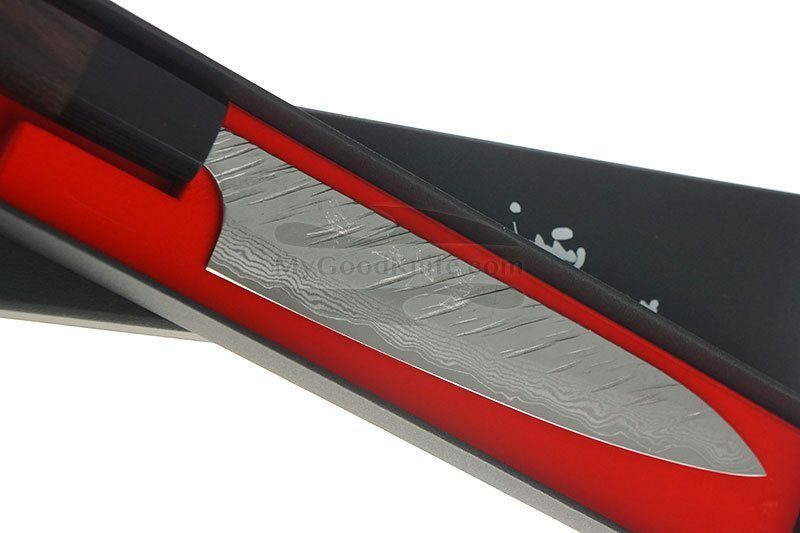 In MyGoodKnife you can buy japanese kitchen knives at discount price.